Santa Anas failed to show at the 4,100 acre Lilac Fire overnight, giving firefighters an assist as they etched fire lines around 60 percent of the blaze Sunday. More than 1,400 fire personnel entered the fourth day of battling the flames. The blaze near Fallbrook has destroyed at least 182 structures and damaged 23 others. Thousands of North County residents fled their homes after the fire broke out around 11:15 a.m. on Thursday, just west of Interstate 15 and north of Lilac Road in Pala Mesa amid gusty, arid weather. 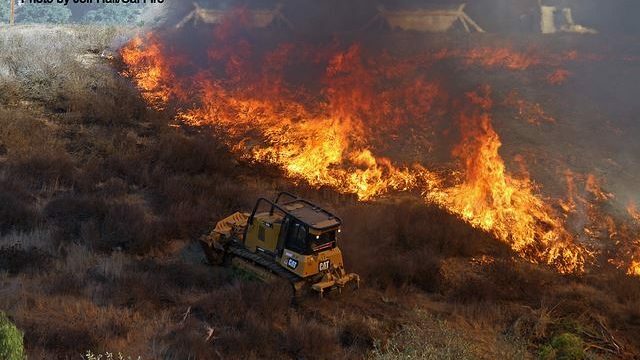 About 110 people who remain evacuated from their homes due to the fire have been consolidated to two shelters: Palomar College in San Marcos and Bostonia Park and Recreation Center in El Cajon, according to San Diego County. Large animals can be sheltered at the Del Mar Fairgrounds. At least 1,500 structures remain threatened, authorities said. The number of acres affected by the fire has remained steady since Thursday night. 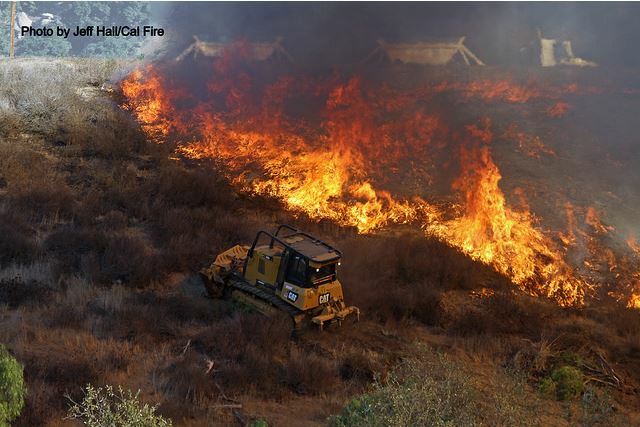 Since then, firefighters have been working to increase the containment of the fire — reducing the number of hot spots that could reignite when fanned by Santa Ana winds. “There’s still tons and tons of hot spots out there,” Cal Fire Capt. Jon Heggie told KUSI on Saturday morning. Crews have largely transitioned their efforts from the air to the ground, he said. Strong winds are expected to continue Sunday. A Red Flag Warning issued by the National Weather Service is in effect until 8 p.m. The strongest winds are expected in the San Diego County mountains and foothills, with gusts over 60 mph. The winds, coupled with humidity levels below 15 percent, make for prime fire conditions. People should avoid activities that could cause fires, authorities said. That includes keeping vehicles off dry grass, practicing safe towing, avoiding activities with open flames, properly discarding cigarettes and obeying burn bans. State damage assessment teams have begun their inspections, and damaged and destroyed numbers are likely to change, authorities said. There were at least six injuries reported Thursday, including a firefighter who dislocated a shoulder and one who was taken to a hospital for smoke inhalation. Three non-firefighters suffered burn wounds of unknown severity while another person suffered a case of smoke inhalation. State Route 76 from the Interstate 15 Freeway and East Vista Way remains closed. The county has issued boil water orders for some areas affected by power outages: the Boulevard Pines Movile Home and RV Park in Boulevard, Butterfield Ranch in Julian and Cameron Corners and Campo Group in Campo. The order will be lifted once tests confirm water in those areas is not contaminated by bacteria. Legoland California re-opened Saturday after closing Friday due to the fire. The cause of the fire remains under investigation.